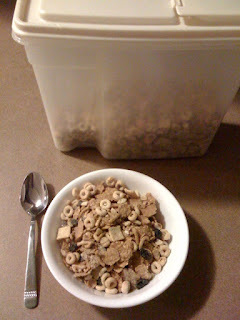 since i've been a mom and housewife, i have developed a pet peeve: cereal boxes in the pantry containing less than enough to make a bowl of cereal. how this happens, i'll never know. because it seems to me that the cereal makers know exactly the amount of cereal to put in each box so that it makes an even number of bowls. but somehow, in our household, i keep finding cereal boxes in the pantry with not enough cereal. it's not crumbs- it's not that someone is putting empty cereal boxes back in the pantry. there's still cereal left, but only about 1/4 or 1/8 of a cup. this new pet peeve irk'd me so badly... i had to do something. ta-da! the mix-n-match never-ending cereal box! anytime a box of cereal gets down to that awkward amount, i add it to this box and it makes a very delicious, nutritious, colorful and flavorful cereal! you never knew how good Kix was mixed with Raisin Bran and Fiber One and Cinnamon Toast Crunch and Kashi Go Lean! and now i look forward to finding those almost empty boxes of cereal so i can add a new flavor to the mix-n-match box. the hodgepodge cereal box works for me. check out more WFMW at We Are That Family.